Bryan, TX, July 10, 2017—Dr. Ronald Deskin, a Pediatric Otolaryngologist (Ear, Nose and Throat specialist) recently joined CHI St. Joseph Health Medical Group, rounding out the specialist team at CHI St. Joseph Health Central Texas ENT. Currently seeing patients two days per week at the ENT clinic, located at 2805 Earl Rudder Freeway in College Station, Dr. Deskin brings 40 years of experience and extensive training in diagnosing and treating ear, nose and throat conditions in children. A Pediatrician might refer their patients – from birth to teenage years – to a Pediatric Otolaryngologist for ear, nose and throat issues, head and neck diseases or to help identify communication disorders. With pediatric care at the core of their medical practice, Pediatric Otolaryngologists are specially trained in the unique nature of medical and surgical care of children. In becoming part of CHI St. Joseph Health ENT Associates, Dr. Deskin joins both an established practice and expert team of board-certified ENT doctors comprised of Drs. Thomas Salzer and Steven Wright. Together, this team brings extensive knowledge and expertise across the spectrum of ENT medicine and surgery. Dr. Deskin relocated to the Brazos Valley most recently from Dallas, where he served as a professor in the Department of Otolaryngology and Pediatrics at the University of Texas Southwestern Medical Center. He completed his medical degree, pediatric internship and Otolaryngology residency at UTMB Galveston as well as a fellowship in Pediatric Otolaryngology at Boston Children’s Hospital. About CHI St. Joseph Health Medical Group: With more than 100 employed providers, CHI St. Joseph Health Medical Group offers patients access to primary care physicians, specialists and advanced practice clinicians. The network features more than 30 ambulatory clinics featuring primary care, a freestanding Emergency Room and Express Clinics. 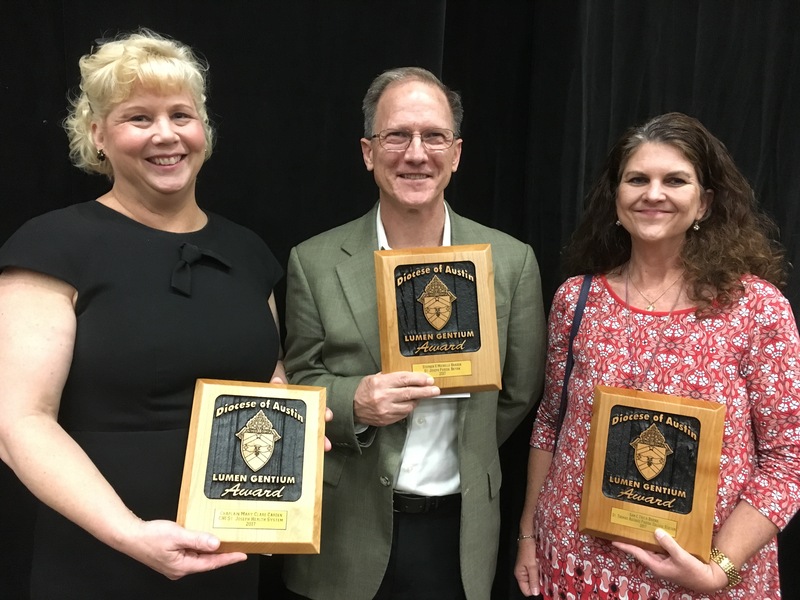 Bryan, TX, July 17, 2017— The Roman Catholic Diocese of Austin presented the Lumen Gentium (Light of the World) Award to three CHI St. Joseph Health team members in June, recognizing their stewardship and leadership. “Your generous offering of time and talent has made a difference in the light of the community and is an example of true Christian stewardship,” Bishop Joe Vásquez told honorees in an awards ceremony June 20. CHI St. Joseph Health honorees included Director of Spiritual Care Mary Clare Carden and Primary Care Bryan Dr. Stephen Braden and Patient Access Representative Tricia Barina. Two honorees from CHI St. Joseph Health – Dr. Braden and Barina – were nominated by their respective home parishes, St. Joseph Catholic Church of Bryan and St. Thomas Aquinas Catholic Church of College Station, for their volunteerism. Dr. Braden has led annual medical missions to Guatemala, and Barina served as her parish’s Art and Environment Chair. Nominated by CHI St. Joseph Health Monsignor John Malinowski, Carden initiated development of both the Bryan Health Resource Center and Charity Tracker. The Health Resource Center coordinates services with local agencies and church ministries, creating a roadmap for people and families seeking assistance and healthier lifestyles. Charity Tracker is a database that connects agencies and churches with the healthcare needs of the local community. Each Lumen Gentium honoree received a plaque and a photo with the Bishop. About CHI St. Joseph Health: Since 1936, CHI St. Joseph Health has been caring for the Texas Brazos Valley. With the area’s only Level II Trauma Center, the first Joint Commission-certified Primary Stroke Center and the first accredited Chest Pain Center in the Brazos Valley, CHI St. Joseph Health is a leader in critical care and the largest provider of cardiovascular care in the region.